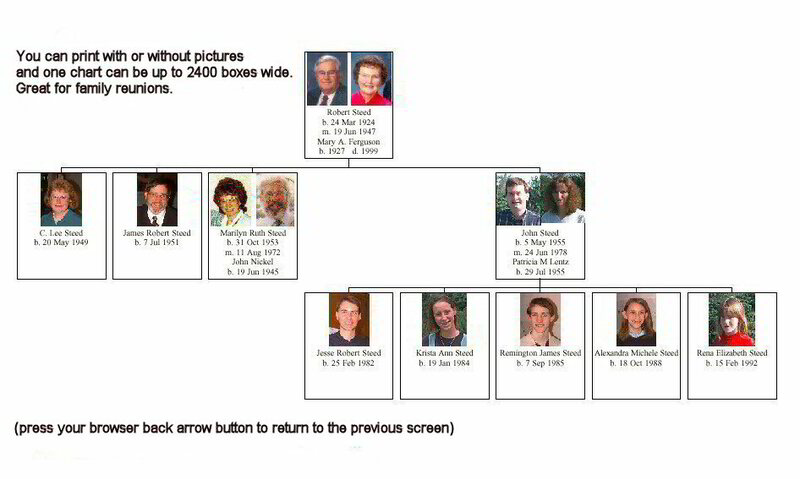 Brother's Keeper is a Windows genealogy program that will help you input and organize your family history information and let you print a large variety of charts and reports. Brother's Keeper works with Windows 98, ME, NT, 2000, XP, Vista, Windows 7, 8, 8.1, and Windows 10. You can download a free trial version of BK to try it out. If you are using BK 6 now, and if you plan to upgrade to Windows 10, then it is easier if you first upgrade to BK 7.3 and then upgrade to Windows 10. However, you can upgrade to BK 7.3 after getting Windows 10. Click here to ORDER the registered version of 7.3 or the 7.3 update from our SECURE ONLINE STORE. Click here for help in Norwegian. Click here for help in Danish. There is NOT a Macintosh version of Brother's Keeper. However, if you have a new Mac that is set up to run Windows programs, then it should run in Windows mode. Click here to order BK from our secure online store. their contents requires the advance permission of John Steed.